Bridesmaids play an important role in a wedding party. They can be the best friends of brides. 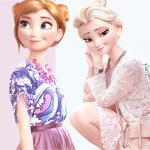 Anna and Elsa are invited to a wedding ceremony. They become the bride’s bridesmaids. For both of them, it’s a great honor because they love their friend so much and wish her happy forever. 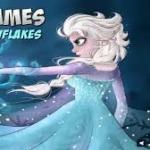 In Anna And Elsa Glittery Bridesmaids at Friv 3 girl games, your mission is to help Anna and Elsa dress up beautifully. 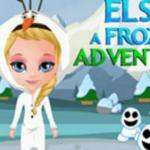 The game offers a huge collection of fashion items for a bridesmaid that you can freely choose. They all look so stunning and gorgeous with different styles and colors. Let’s help each of princess try on all of them, then pick out the most suitable one. There are 4 bridesmaid dresses, 4 tops, and 4 skirts. All of them are shining and spackling. You can mix and match a skirt with a top or choose a perfect dress at your disposal. After that, you beautify their hairstyle with a vintage headband. Don’t forget to finish their looks with necklace, and earrings. Now, it’s time to make them more beautiful with a layer of stunning makeup. 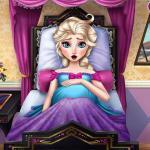 Well, like other makeover games, you do makeup step by step carefully. Choose suitable colors and style for each of them, then turn them into the prettiest bridesmaids ever. After everything is done. They are ready to complete their duty in the most unforgettable day of the bride. 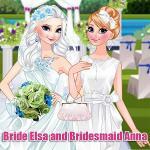 Hope you have fun with Anna And Elsa Glittery Bridesmaids. 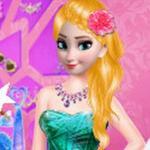 Try these following dress-up games at http://friv3play.net/ such as: Princesses Different Style Wedding.